How does studying whale acoustics lead to increased knowledge about the depth range of nudibranchs? Just a little more is now known about the orange doto’s depth range. Photo: Hildering. Let me take you deep and share an experience from my recent time offshore in the eastern North Pacific on a DFO cetacean survey. 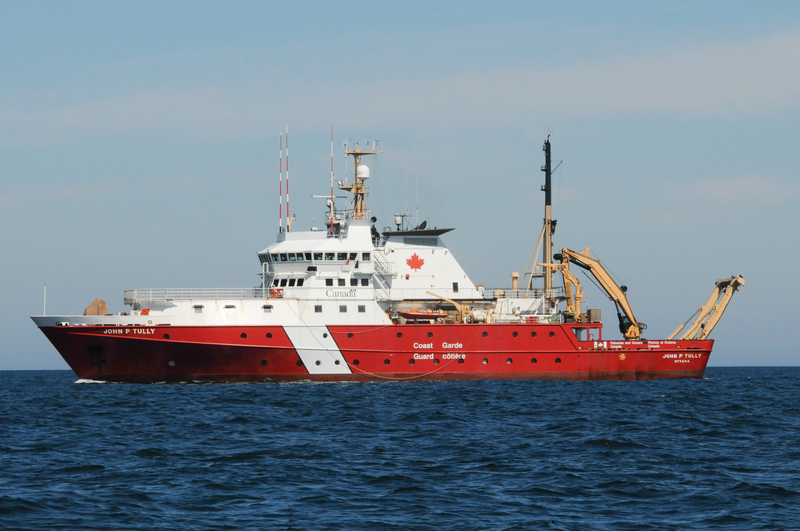 This is the Canadian Coast Guard Ship – the J.P. Tully. Among the offshore science expeditions undertaken upon the Tully, are surveys by DFO’s Cetacean Research Program. These line transect studies provide an estimate of cetacean abundance, as well as an opportunity to ID individual whales and collect feeding and genetic information. The knowledge about abundance and location is of particular importance for the large whales that were hunted so intensely and require protection under Canada’s Species at Risk Act. 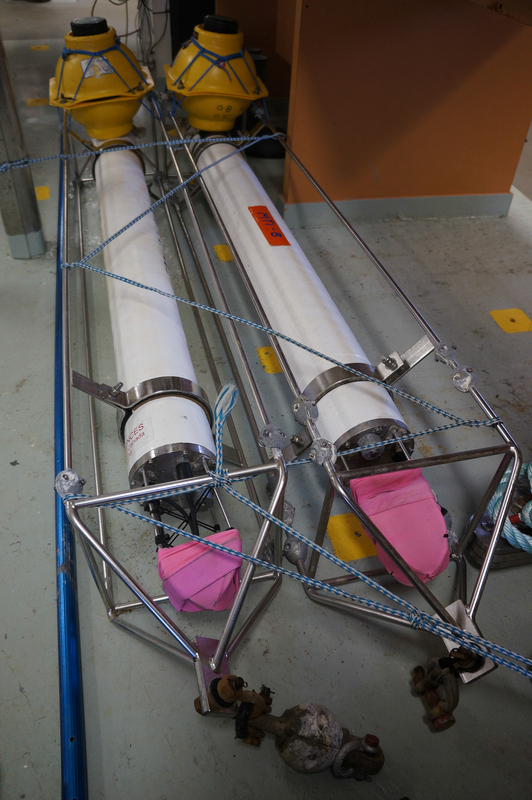 These are Autonomous Underwater Recorders for Acoustic Listening (AURAL-M2s). AURALs are hydrophones that can be deployed to 300 m, making time-spaced recordings (e.g. 15 minutes every hour) for up to a year. Such acoustic monitoring is a very important supplement to the cetacean vessel surveys. The AURALs are of course placed very strategically, in remote, offshore locations. By passively recording whale calls, the AURALs can provide information about the location and seasonality of whale species which may aid in determining critical habitat. The AURALs are a wonder of technology. It is of course no problem to get something to the bottom of the ocean but, getting it back to the surface so you can retrieve your equipment and data is not so simple. It is achieved with an acoustic release (“D” in the diagram below). 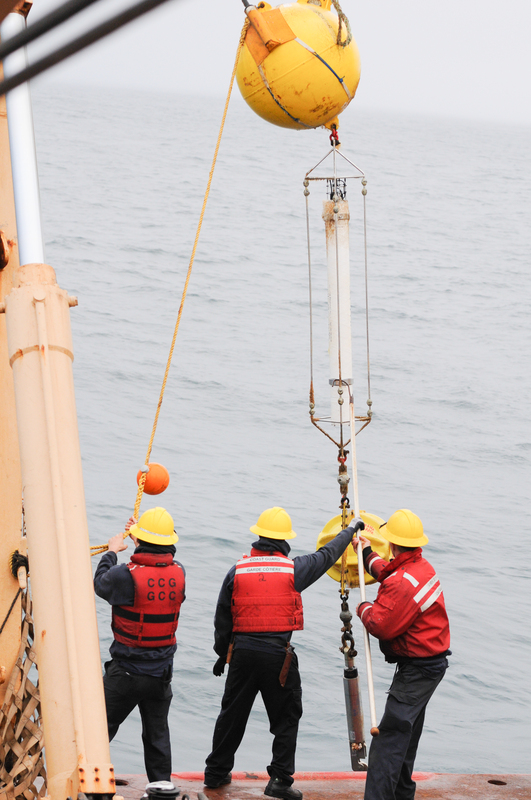 Once the vessel is positioned so that there is no chance of the device coming up under it, a sound signal is sent to the device and the AURAL releases from its anchor and floats to the surface thanks to the big yellow buoy. AURAL-M2. Click to see an enlarged, labeled schematic on the Multi-Electronique webpage. 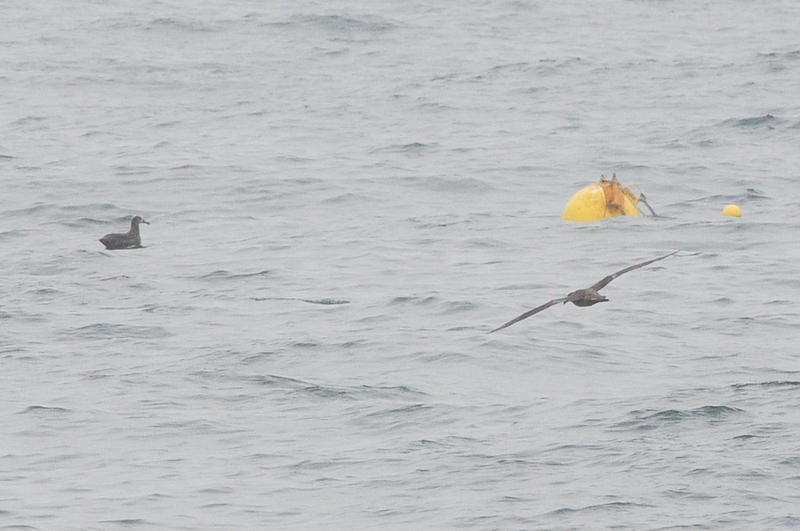 These are two perplexed black-footed albatrosses! A big yellow orb has just popped up to the surface as a result of the acoustic release signal. This AURAL was at 226 m depth at the Bowie Seamount, 180 km west of Haida Gwaii. It had been there for a year. Black-footed albatross just after the buoy with the AURAL recording device came up from 226 m.
Here, the highly skilled Coast Guard crew get the AURAL back aboard the ship so that the data can be retrieved and, ultimately, analyzed for whale vocals. But, there was also a year’s worth of growth on the buoy and who knows what you might find . . .
Nudibranchs! Three species found and even one species with eggs! 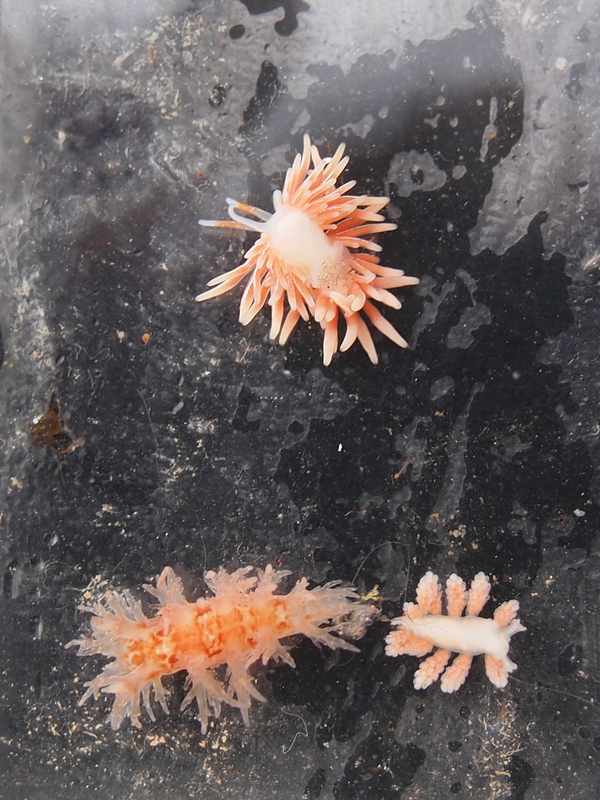 3 nudibranch species on the AURAL that had been at 226 m. BC aeolid; bushy-backed nudibranch and orange doto. Click to enlarge. Photo: Hildering. Top: BC aeolid (Catriona columbiana to 1.5 cm); eggs also found. By examining the AURAL that had been at 226 m, it confirms that these 3 species of nudibranch have a range to at least that depth. I shared the find with those who have nudibranch expertise much greater than my own (Dave Behrens via Andy Lamb) and learned that for two of the species, there had been no previous record for them at this depth. 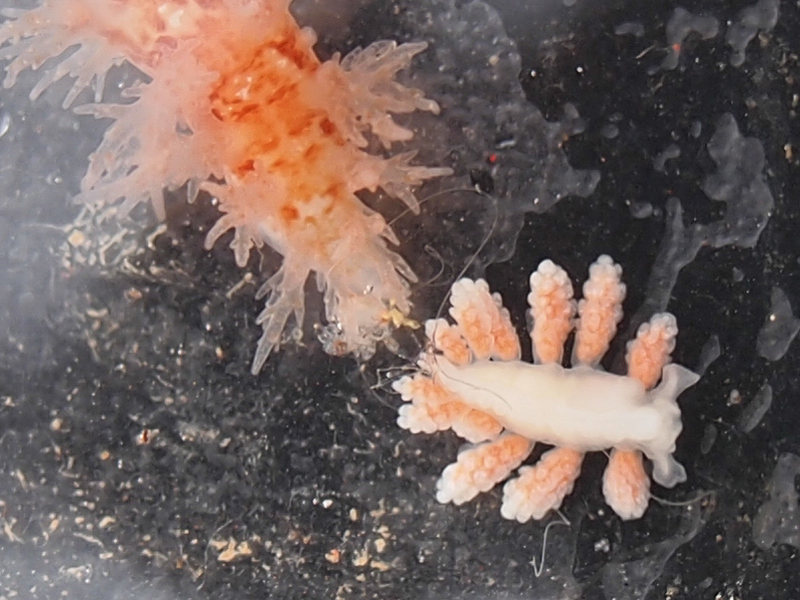 It has long been known that some nudibranch species range to depths of at least 700 m. However, you can imagine what a a challenge it is to get species specific depth information. We camera carrying scuba divers can’t help beyond 40 m depth (deeper if diving with mixed gases). So it’s not a big scientific discovery. Compared to the data the AURAL will reveal about endangered whales, it’s just a sea-slug-sized discovery. 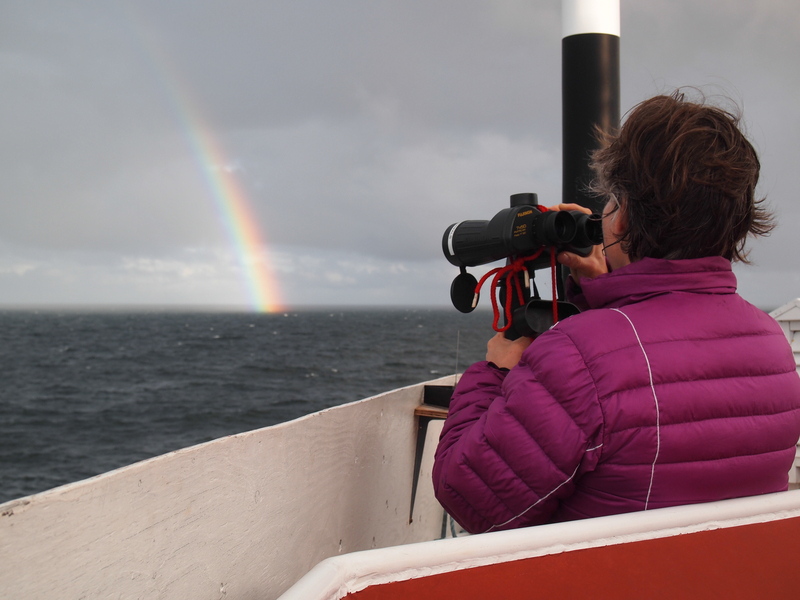 This is me – back on survey duty looking for much bigger organisms but delighting in how collecting data to help save whales, led to learning a bit more about the little guys. Spotter duty on the DFO Cetacean Program’s offshore survey. July 2013. Christie McMillan photo. See the CSAS technical report is by Linda Nichol and Dr. John Ford on the importance of the line transect surveys to the recovery of endangered cetaceans: Information relevant to the assessment of critical habitat for Blue, Fin, Sei and North Pacific Right Whales in British Columbia. A few more photos from this DFO cetacean survey will soon be posted in this FaceBook album. Scroll down at this link to hear samples of marine mammal vocals recorded by AURALs. 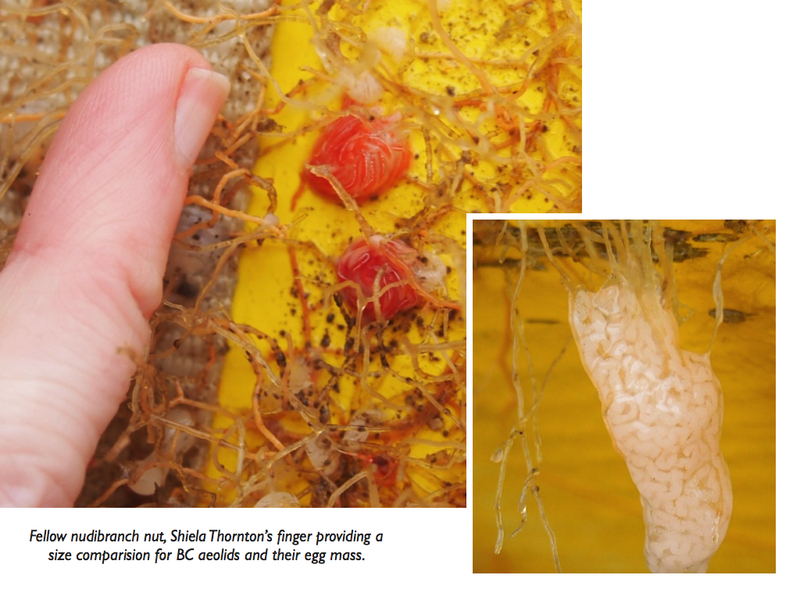 This is really cool information about the nudis. Thanks for sharing it!